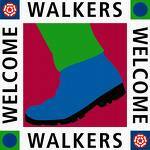 We are accredited to the Visit Britain Walkers Welcome programme. West Dorset is renowned for its hundreds of footpaths, over all types of terrain, which all invariably have beautiful views. Over the past decade, the County Council has invested heavily in signposts, new styles and clearing trails making it a walkers’ paradise. There are several direct from the House, with details in our Guest Information Folder. We are subscribers to Walking World , who hold an excellent detailed library of local walks. Guests can let us know which specific walks they wish to try and we will download full details to await their arrival. The Ordnance Survey provide maps of the surrounding area and possible walks. "OS Explorer" (1:25,000) Maps provde information of camping and caravaning sites, picnic areas and viewpoints, selected areas of intrest, Rights of Way information, National Trail and Recreational Path routes and selected tourist information. "Active OS Explorer" Maps have a special waxy coating on them to stop water damage or tearing, making them great for outdoor use. Explorer Maps that cover the Bridport and surrounding area include OL115, OL116 and OL117. OS Landranger Maps are 1:50,000 scale and give a broader view of the area, LM193 and LM194 cover to the East and West of Dorset as well as inland. Lancombes House is at the edge of most charts but we have had an OS Select map produced which is centred on Lancombes House for your ease - these are available for purchase from us. Walks for Softies is an excellent site for 2-3 hour, easy to follow walks around Dorset. The Country Walking website has thousands of downloadable walks in it's database. The West Dorset District Council website also has information on walks. Lancombes House has a laundry room where items of clothing can be washing and dried. Arranging a group walking holiday? If you are looking at arranging a group walking holiday in the beautiful Dorset countryside, please contact us for our Group Organisers Pack.